Meet Tayna - the oldest known object in the observable universe. 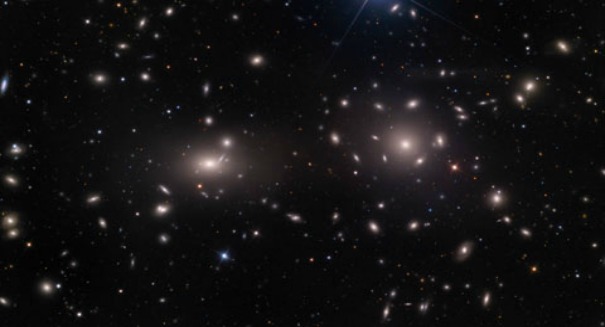 Check out NASA's stunning new photos of the galaxy formed roughly 13.8 billion years ago. NASA has been quite busy this year; from carrying out some of the most extensive probes of our own solar system to scanning deep space for radio waves that may be communication from other worlds, the agency certainly has a lot on its plate. That doesn’t mean it has no time for history, however. According to a report from IBN Live, NASA researchers have just released new photographs of one of the oldest known objects in the universe. Using the powerful lenses of NASA’s Hubble and Spitzer telescopes, researchers have pinpointed Tayna, an object that existed about 400 million years following the big bang, roughly 13.8 billion years ago. Tayna got its name from the Aymaran word for “first-born,” spoken in the Andes and Altiplano regions in South America. The object may very well be one of the first to exist in the known universe. Both the Hubble and the Spitzer telescopes have detected galaxies that are roughly the same distance from earth as Tayna, but the recently discovered object is different. Unlike other ancient galaxies, this one is newly formed and is believed to be an active star nursery. This is the first time astronomers have detected a galaxy like Tayna, and they believe that there could be many others just like it. The study, published in the Astrophysical Journal, likens Tayna to the Large Magellanic Cloud, or LMC, a galaxy that orbits our very own milky way. A press release from NASA’s Jet Propulsion Laboratory describing the results can be found here.